Deborah Higdon of Ottawa first discovered LEGO as a seven year old when visiting family friends. She never really had the opportunity to play with LEGO as a child as they only had a few sets as a family. As an adult, she regularly gifted LEGO sets to nieces and nephews (which she then helped build when she visited) but didn’t start buying for herself until she was 40 years old. 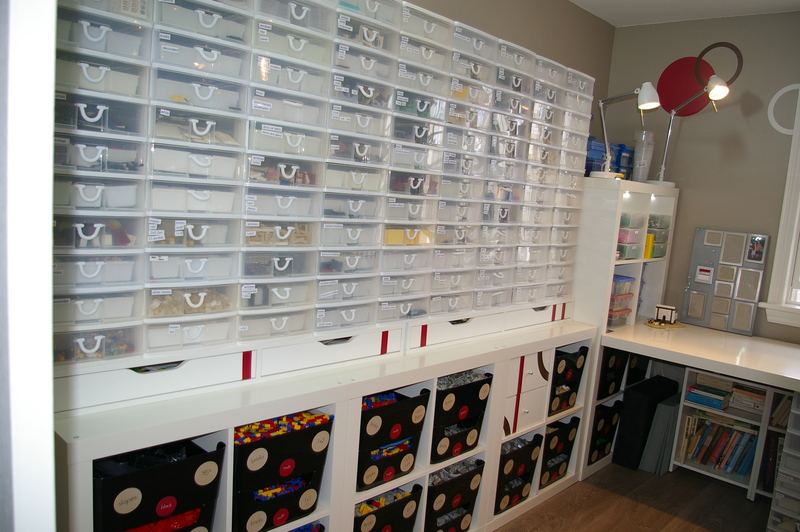 Since then, Deborah has become an award-winning skilled builder and was featured in the book The LEGO Ideas Book. She is currently a member of ParLUGment, which is Ottawa’s adult LEGO fan group. Unlike a lot of other AFOLs, Deborah doesn’t have a particular favourite LEGO theme. She doesn’t get excited when the “next big thing” is announced. For her, it’s all about the parts and colours and their potential in future builds. Deborah’s favourite building theme is architecture and design and she enjoys developing both interior and exterior details. 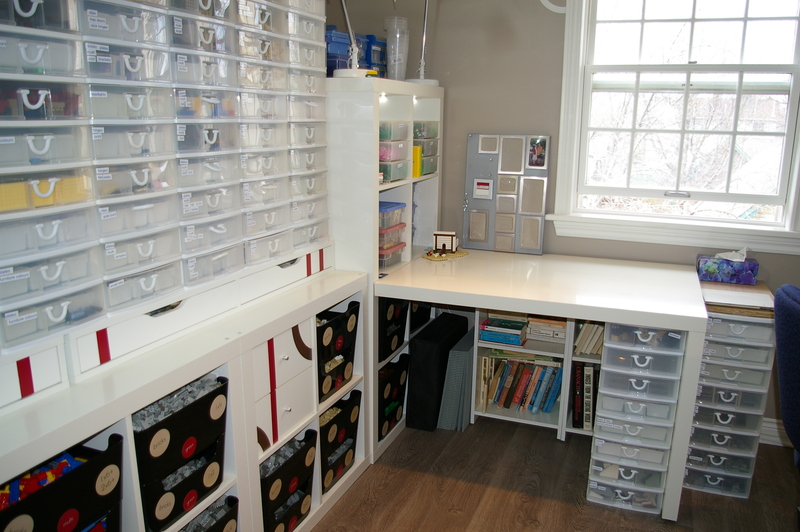 Deborah’s storage method is very organic and strongly reflects her building style and preferred techniques. She sorts by usage and her love of the different pieces, which, essentially, is by type of piece. For example, all of the tiles are in a tower of their own and a drawer for each colour where possible. Within each drawer they are then separated by size. The tile tower is the closest to the build table and then, the rest of the parts are ordered according to usage. Plates are the second closest but her favourite colours have their own drawer. The less she uses a piece or likes it, the less separated the pieces are. As her respect for Technic increases (as she acquires more parts) they are being separated out more than they were previously. Her minifigs are still thrown together in the one drawer but she is starting to separate the torsos from the legs. 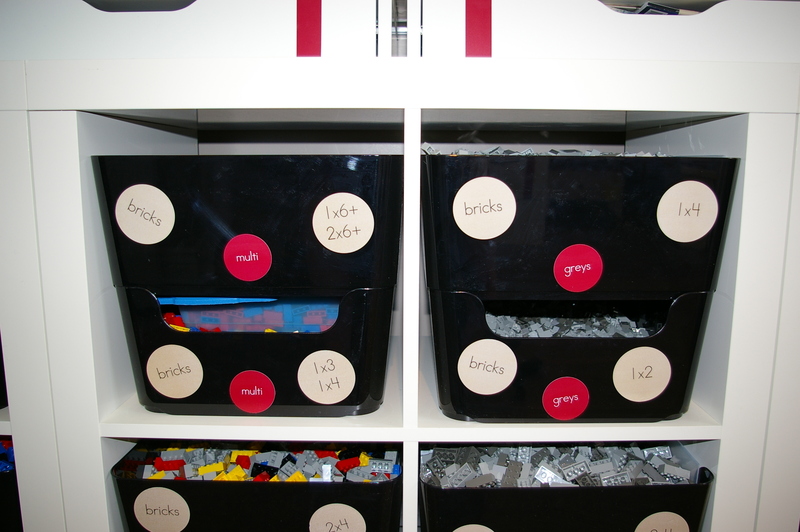 Minifig accessories, however, are well sorted and she has a few drawers for “small bits” – tiny things she looks through for fine detailing of MOCs. Trans pieces, mostly used for water, have their own tower as well. In terms of bulk brick, Deborah separates white, tan and old greys as she uses them more frequently and all green and brown plate and brick are kept in a separate tower because they’re used for detailing landscapes and gardens. She also has a special tower for “furniture details” which includes all the curves and smaller pieces she uses to create furniture. Like a lot of other LEGO fans, Deborah really enjoys meeting other LEGO Fans, sharing ideas, seeing their work and generally being blown away by the level of creativity that’s out there. She loves attending LEGO fan events and sharing the love of the brick or spending hours talking about the legoness of things, sharing techniques or inspiring those who have never thought to give LEGO a try. Part of this is stopping the shaming that goes with the love of a children’s toy – proving to others that creativity takes all forms and no one should be embarrassed by what they build. Deborah has some concerns regarding how our very symbiotic relationship with this toy company can be distorted and turned ugly by a few people who have developed unrealistic expectations. As much as she would love the system to expand so the 1×1 round tiles are available in almost every colour, she knows that the fact that they are not should be spawning creativity and we should be working with this rather than getting annoyed. Added to this, the sense of entitlement that has developed as LEGO supports AFOLs more and more is really disheartening to Deborah. She really hates that those who work for the LEGO Community Team often see nothing more than a hand out to grab more of what the company does to support us. Sometimes it must seem like a very thankless job. Her building space looks amazing! Everything is so organized and it seems very clutter-free. I’m sure that’s very helpful in the design and building process.